It is recommended in Feng Shui to avoid having your bed head, god altar, study table or stove facing or leaning against the toilet. 1. 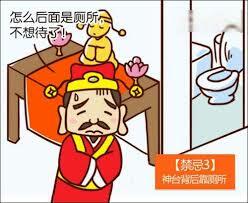 If you have your god altar or ancestor facing the toilet, you will not have the blessing because they will not stay. 2. If you have your god facing the toilet, it will disrupt the tranquil of the family. 3. If your study table is leaning against the toilet, it will cause you to have illogical thinking and also affect your examination luck. 4. 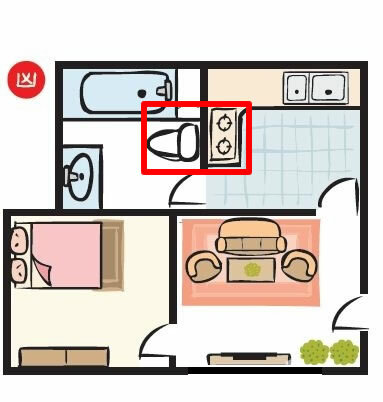 If your stove is on the same partition wall with the toilet bowl, it tends to cause stomach and intestines problem. 5. If your stove is facing the toilet, you tend not to preserve your wealth. 6. 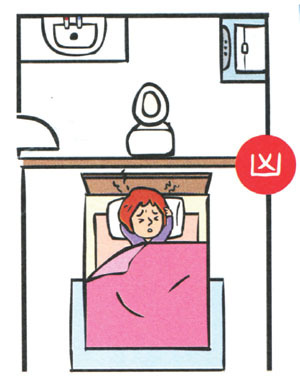 If your head bed is leaning against the toilet, you tends to have headache and nightmares that cause you to be tired, which eventually led to deterioration of your health. Take note of these Feng Shui tips and make your home a better place to stay in.